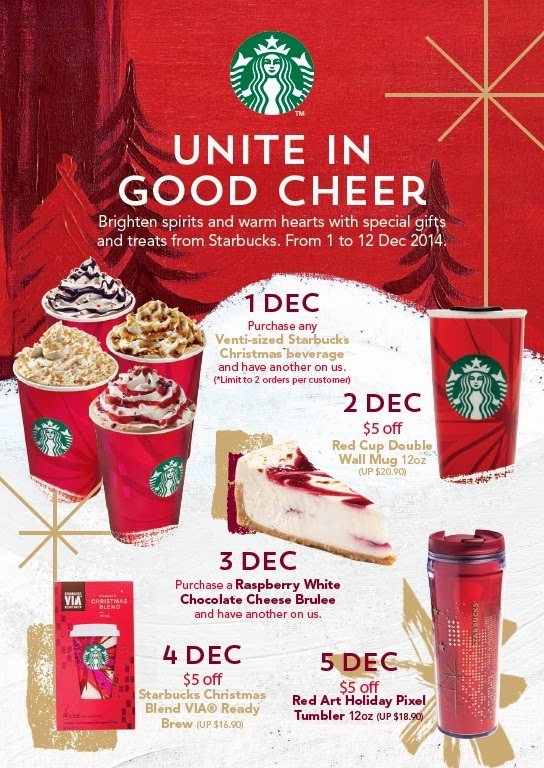 Deck the halls as the festive season approaches, it's time for sharing and nothing beats doing it with Starbucks Coffee! Every year Starbucks has the favourite Christmas drinks - Peppermint Mocha, Toffee Nut Latte and Cranberry White Chocolate Mocha. But this year, Starbucks Coffee Singapore is bringing to us a new addition - Christmas Cookie Latte, inspired by the comfort of togetherness and fellowship. Think buttery creamy latte infused with shortbread cookie sauce, topped with whipped cream, shortbread cookie drizzle and butter cookie crumbles, this latest seasonal drink is sure to give you a merry surprise with every sip. 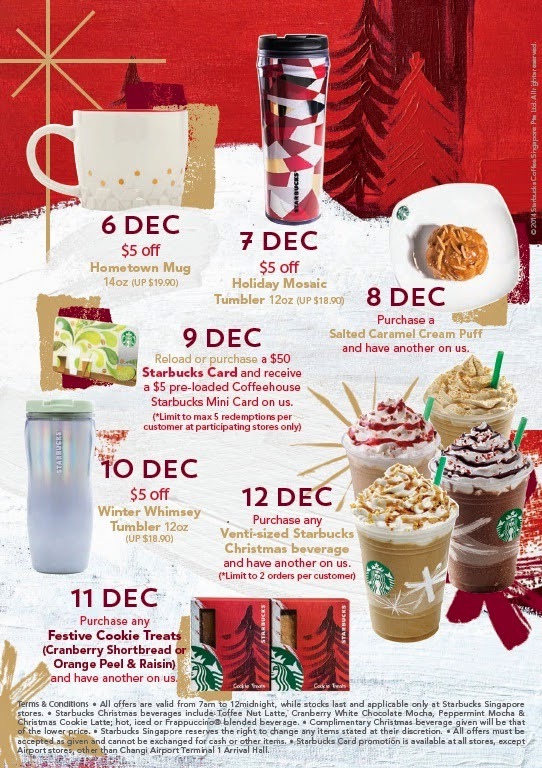 It can be served hot, iced or Frappuccino® blended beverage and you can try the Christmas Cookie Latte at all Starbucks Singapore stores from tomorrow, 25th November 2014. On top of that, there's the upcoming Annual Christmas Open House happening on 4th December and the 12 Days of Christmas promotion. Better prepare your "reindeers" for it! 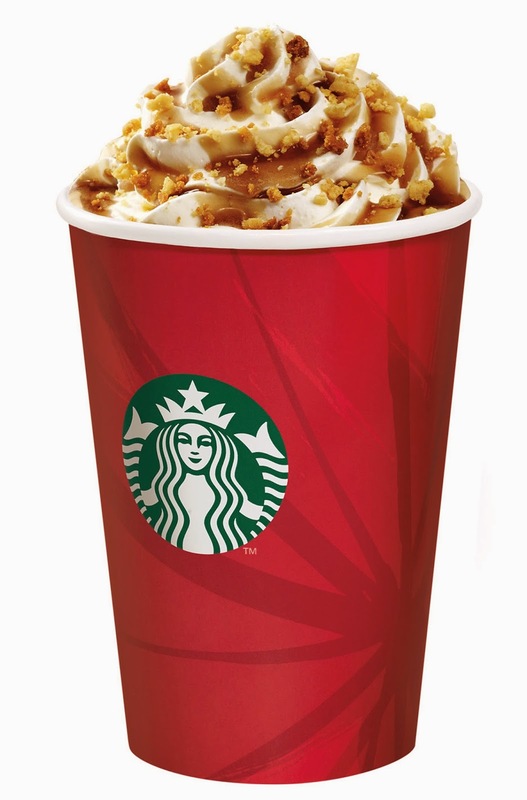 Starbucks and The Salvation Army will be holding the much-loved Starbucks Christmas Open House on Thursday, 4th December 2014, from 5 – 7pm across all Starbucks outlets island-wide. Coffee lovers will be able to enjoy a complimentary tall-sized Starbucks beverage during that period, while volunteers collect donations for The Salvation Army. In celebration of the Starbucks Christmas Open House, Starbucks will also be partnering Philsax and the Ministry of Bellz to hold intimate Christmas Get-togethers at selected Starbucks stores to share the festive joy. With all festive seasons, there will of course be festive promotions. 12 Days of Christmas will be back with new festive treats galore from 1st to 12thDecember. Attractive promotions include the all-time favorite buy-one-get-one Christmas Venti beverage, limited to 2 redemptions per customer, as well as $5 off your favorite selected Starbucks merchandise. More as seen above. For more information, visit Starbucks.com.sg.